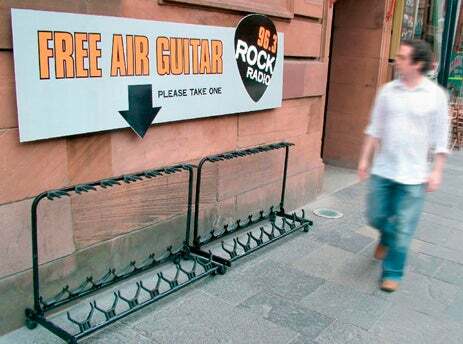 Or on a large scale… Larger scale guerilla marketing Either way if done right it’s often brilliant! What guerilla marketing is not. If you decide to start spam sharing your Facebook, you’re not taking part in a guerilla marketing campaign. What you’re taking part in the is an annoyance. Someone is eventually going to tell you to put your company somewhere very unpleasant and that’s not good. Think of it as investing imagination and and time rather than money (although a budget is still required, it’s not as much as using traditional media). Why does guerilla marketing work? we looked through a number of guerilla marketing campaigns and came up with some reasons why we think it can be so successful. Firstly, people make unconscious decisions. Even though we can choose to think or say something, unconsciously we are always making decisions. That Kit-Kat disguised bench we just sat down on? We unconsciously noticed it there, we’re thinking of it as a bench but we know it’s a pretty brilliant marketing ploy from the folks at Nestlé. Secondly, the best guerilla marketing campaigns have both a human and a business appeal. We might laugh and enjoy an amazingly smart campaign, but we’ll also think (unconsciously again!) that this specific campaign must be doing great for business. Finally, your customers will appreciate the efforts and thoughts gone into your guerilla marketing campaign. In turn for your efforts, your customers will naturally put fourth an effort to purchase your product. MEOIC The guerilla marketing anagram that wasn’t to be. We were extremely close to putting together an anagram, but if you think MEOIC is an effective anagram then we ask you kindly to leave. However here’s a few little tips you could take into consideration if you’re putting together a guerilla marketing campaign. Try to create memories for the people who will see the campaign. Don’t let them forget all the time and imagination you have put in to this project! Be entertaining! Show some humour in your campaign or even get across an important message in an interesting fashion. Try, try and try again to original. Your idea has probably been done before. So take some time to come up with new and exciting spins. If you can, make the experience an interactive one. Something as simple as feeling or hearing the campaign can work wonders. Finally, be as creative as possible! If your budget doesn’t fit your creative mind, just be cunning. Your campaign doesn’t have to be huge to be noticed. Sometimes the smaller ideas give a better message!